The Mars Orbiter Mission spacecraft has completed 1,000 earth days in its orbit on June 19, 2017 well beyond its designed mission life of six months. Bengaluru: The country's low-cost Mars mission spacecraft that is on a rendezvous with the Red planet for an extended period completed 1,000 earth days in its orbit today. "MOM completes 1,000 earth days in its orbit, today (June 19, 2017) well beyond its designed mission life of six months. 1,000 earth days corresponds to 973.24 Mars Sols (Martian Solar day) and MOM completed 388 orbits," ISRO said. The satellite is in good health and continues to work as expected, it said, adding that scientific analysis of the data received from the Mars Orbiter spacecraft is in progress. India on September 24, 2014 successfully placed the Mars Orbiter Mission (MOM) spacecraft in orbit around Mars in its very first attempt, breaking into an elite club. ISRO had launched the spacecraft on its nine-month-long odyssey on a homegrown PSLV rocket from Sriharikota in Andhra Pradesh on November 5, 2013 and it had escaped the earth's gravitational field on December 1, 2013. 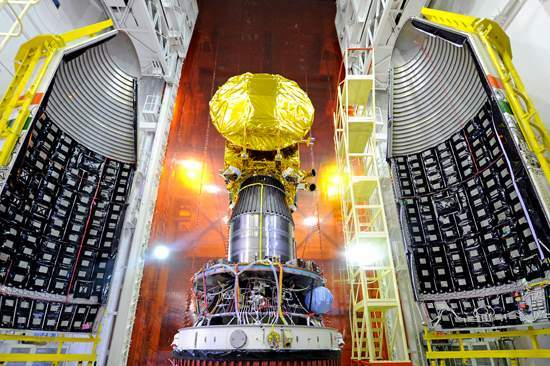 Citing surplus fuel as the reason, ISRO in March, 2015 had first announced that the spacecraft's life was extended for another six months. Later in June, 2015 its Chairman A S Kiran Kumar had said it has enough fuel for it to last "many years". The Rs 450-crore MOM mission is to study the Martian surface and mineral composition, and scan its atmosphere for methane, an indicator of life on Mars. The Mars Colour Camera, one of the scientific payloads onboard MOM, has produced more than 715 images so far, ISRO said. During its journey so far, MOM has gone through a communication 'blackout' as a result of solar conjunction from June 2, 2015 to July 2, 2015. It experienced the 'whiteout' geometry (when the Earth is between the Sun and Mars and too much solar radiation may make it impossible to communicate with Earth) during May 18 to May 30, 2016. An orbital manoeuvre was also performed on MOM spacecraft to avoid the impending long eclipse duration for the satellite. ISRO had also launched MOM Announcement of Opportunity (AO) programmes for researchers in the country to use MOM data for R&D. To expand inter-planetary research, ISRO is seeking scientific proposals for Mars Orbiter Mission-2, the government said in November last year.